I remember being surprised to learn that the Ghent Altarpiece (1432) that exists today is not entirely a product of the fifteenth century.1 One of the panels in the altarpiece ("The Just Judges") was stolen in the 1930s, and was repainted by the copyist Jef Vanderveken in 1945 (see left). I think it's telling that none of my art history books mention anything about Vanderveken or this copied panel. And when I traveled to Ghent to see this altarpiece in 2003, I don't remember seeing any information about any other artist than van Eyck. I think there's a reason for this "cover-up": the altarpiece doesn't appear to be a product of pristine history and genius with the knowledge that not everything is "authentic" (i.e. by van Eyck's hand). And I would argue that by extension, to undermine the genius of van Eyck's work would also undermine the genius and authoritative voice of the art historical discipline. This connection between authenticity and the authoritative voice is interesting. One of the most prominent places to encounter an authoritative (and institutional) voice is within the museum setting. Pieces of art are displayed within the museum, and an unspoken authoritative voice tells museum visitors, "This is important and authentic by the mere fact that it's on display." And museum visitors do not question that implied statement (at least, they're not encouraged to do so!). I'm particularly reminded of the forger Han van Meegeren, who duped the art world into thinking it had discovered several paintings by Vermeer (among a few other artists). Van Meegeren's forgeries are now scattered throughout the world in many prominent collections, including the Metropolitan Museum of Art and the National Gallery (Washington, DC). However, from what I can tell, these paintings are not on permanent display at most of these museums. Instead, the forgeries are shuttled down to the depths of storage, to hide the blemish of mistake and allow the museum to still "speak" authoritatively. Furthermore, whenever Van Meegeren paintings are on display for temporary exhibition, it appears that they are almost always labeled with "Imitator of Vermeer" or "After Johannes Vermeer." Even though Van Meegeren was exposed and we know who made the forgeries, museums don't give him any credit for his work! It's as if the museum world still wants to try and tap into the genius of Vermeer by association, even though we know that the paintings are fakes. Bah! Do you know of any other instances where a question of authenticity has undermined the authority of a museum/art appraiser/work of art/art history textbook? 1 In fact, the Ghent altarpiece was not entirely a product of Jan van Eyck "hand." 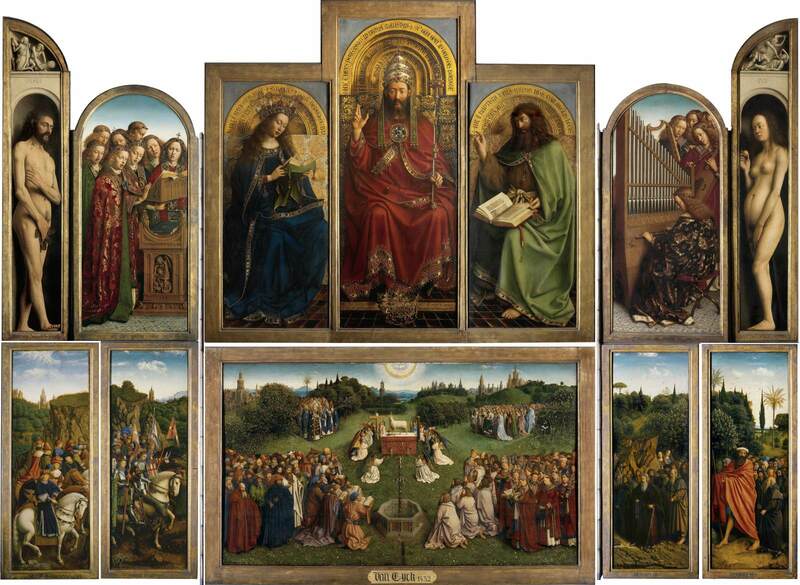 It appears that the Ghent altarpiece was begun by the painter Hubert van Eyck, Jan's brother. See my post on the topic here.